We love a good renovation! There is something about taking down walls, reconfiguring an area for better function and then seeing it finished out that makes our job so worthwhile. But sometimes even the simplest of renovations are even more rewarding! 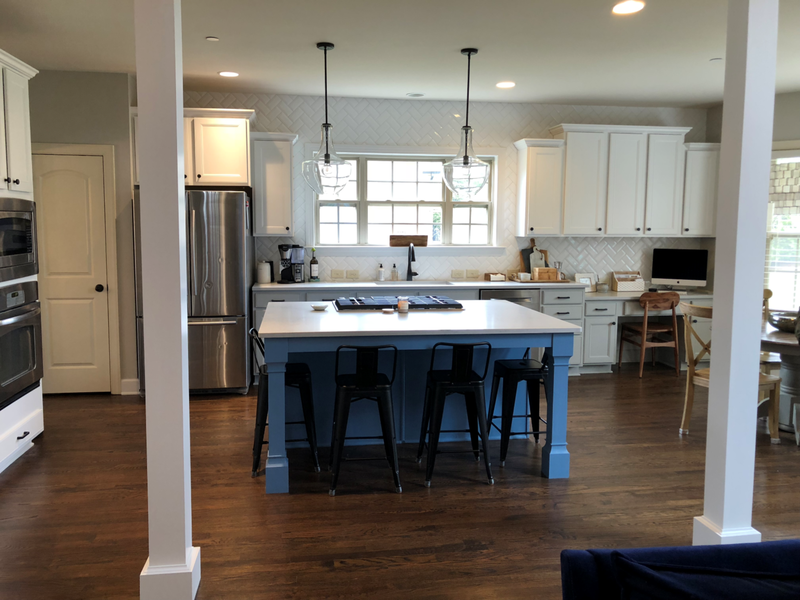 We recently had a sweet couple move to the area and reach out for help on their kitchen that wasn’t functioning properly for a young growing family. The columns separating the kitchen from the main living space were HUGE. Not only were they grossly sized for the rest of the space, they took up much needed space for two small kiddos to run around. So they needed to be modified. 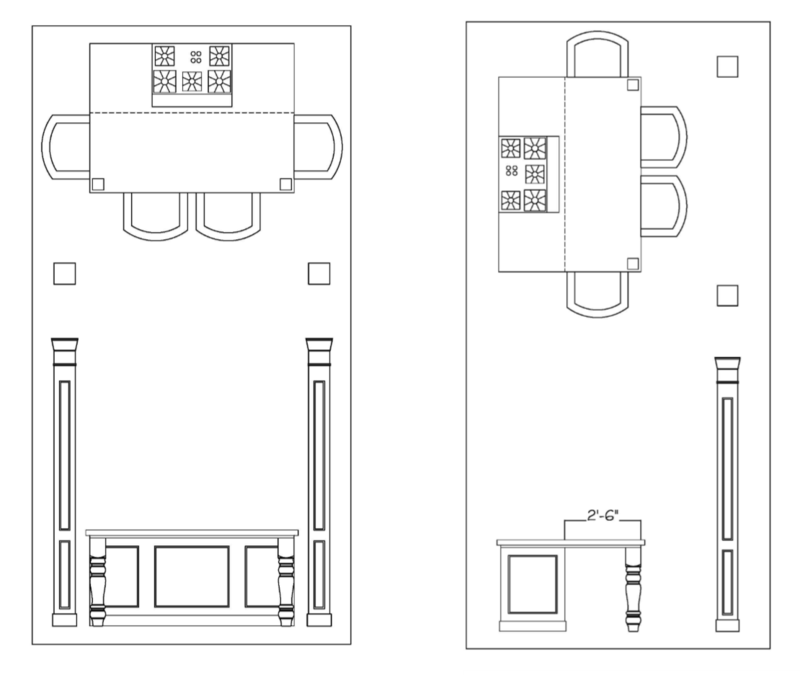 Between the two columns we had an island/sit down bar area. 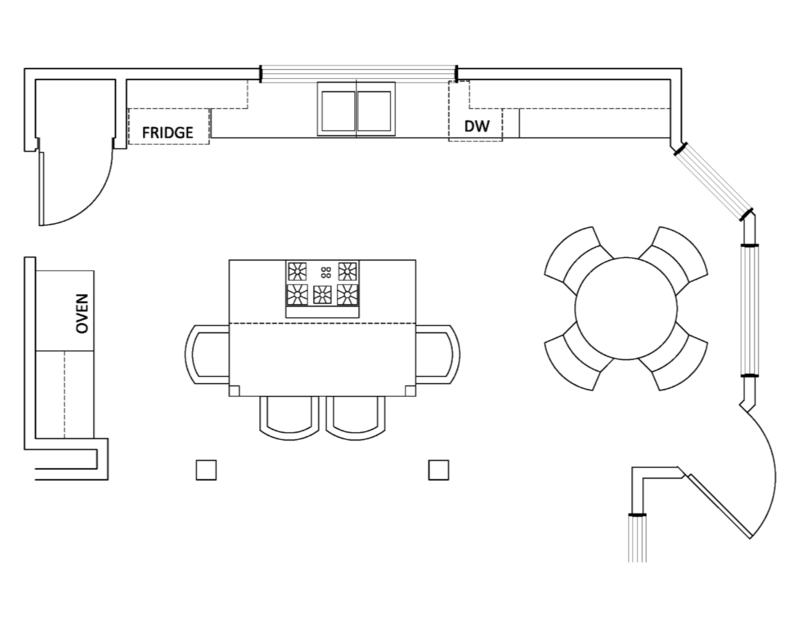 It was impeding too much into the living space and was awkwardly placed away from the rest of the kitchen and really just became an afterthought in the function of the kitchen. This had to be removed. This one actually made a little more sense because it housed the cooktop. But, it was only as deep as the cooktop! Making cooking difficult and slightly dangerous. 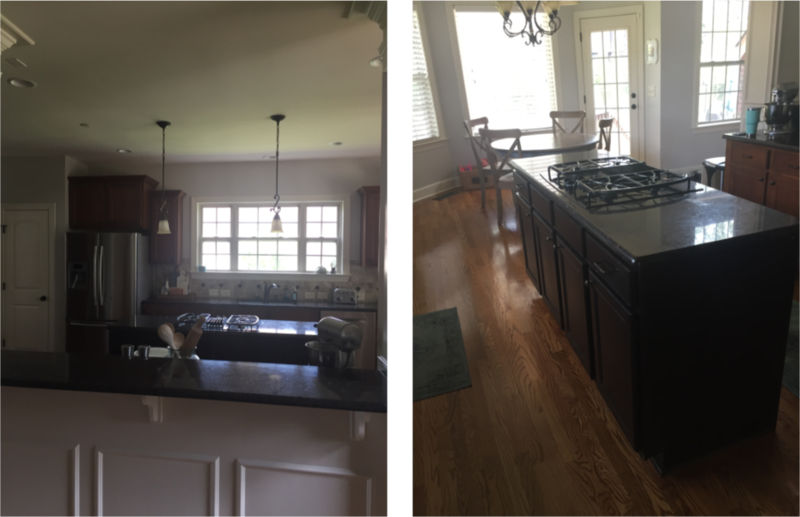 The dark stained cabinets, black countertops and tumbled tile backsplash was not jiving with the new owner’s style. We needed this kitchen to be light, bright and open! 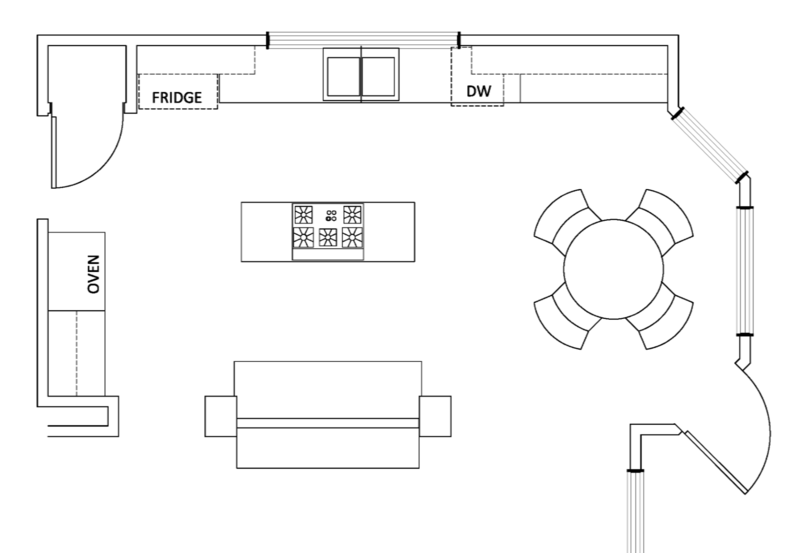 Open the kitchen up and provide a better work area /cooking surface as well as seating for four. Lighten up the overall appearance and update fixtures to a more modern look that reflects the client’s style. All keeping within the set budget. First was those big columns. We knew that they were not structural, but we were not 100% sure they could completely go away. When we opened them up we discovered one housed a waste pipe, which could be moved, but decided financially the best option was to leave in place. It did allow us to get the 17” columns, down to 8”. And that really started to open things up! Also to conserve our monies, we opted to leave the gas line, cooktop and essentially that middle floating island in the same spot. 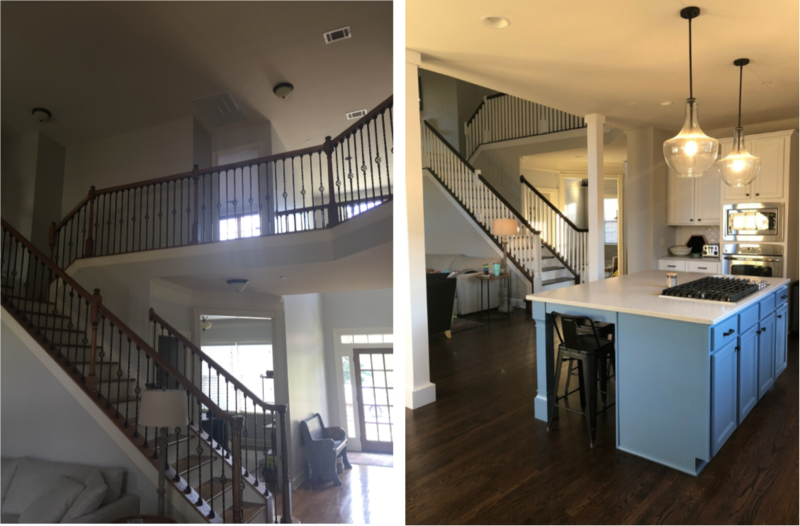 We then added some new decorative island legs and stretched the new countertop out towards the living area to provide counter seating for four. 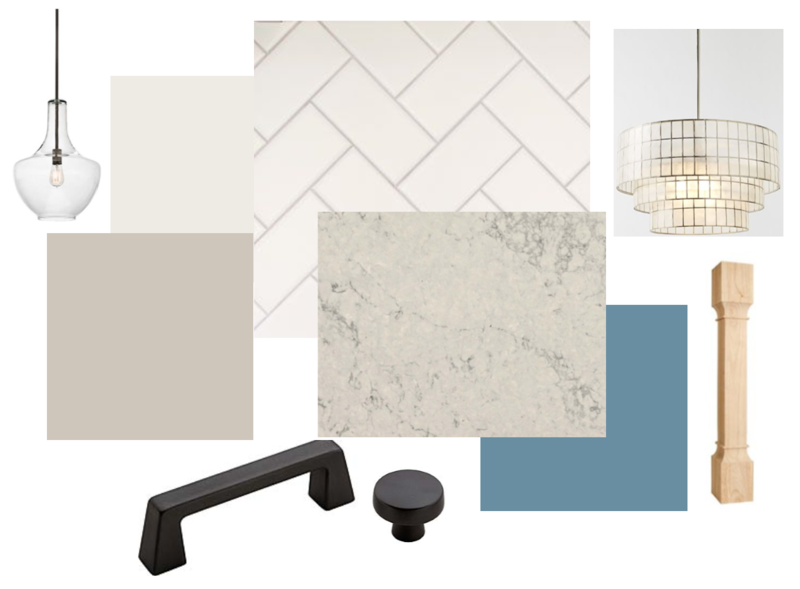 Lastly, we selected finishes to brighten the space. 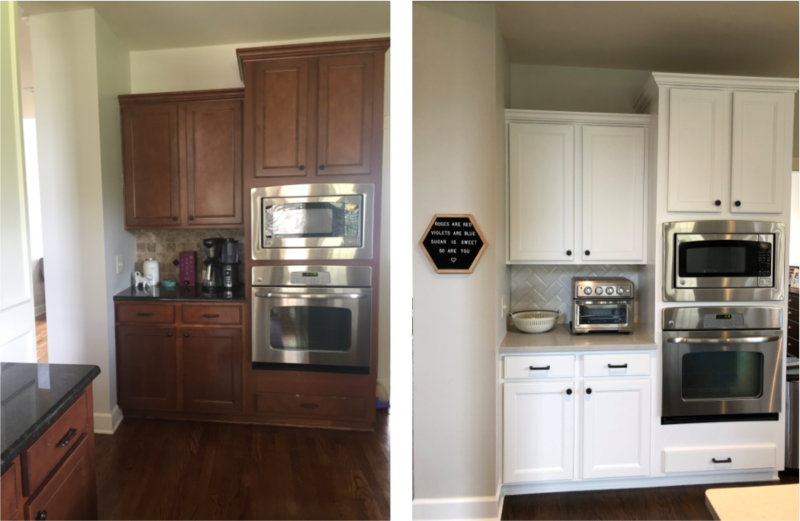 We knew we wanted to paint the cabinets, change the backsplash and get new countertops, but at the time, the client didn’t know that I had planned on: adding visual texture to the walls, selected basically an indestructible countertop surface, and had a wild card of color up my sleeve! Knowing that we were keeping the cabinets as is, allowed us to spend a little extra in other places. We went with a subway tile, but instead of the typical below the cabinet, brick lay installation. I wanted to see the entire wall in tile, herringbone installation. 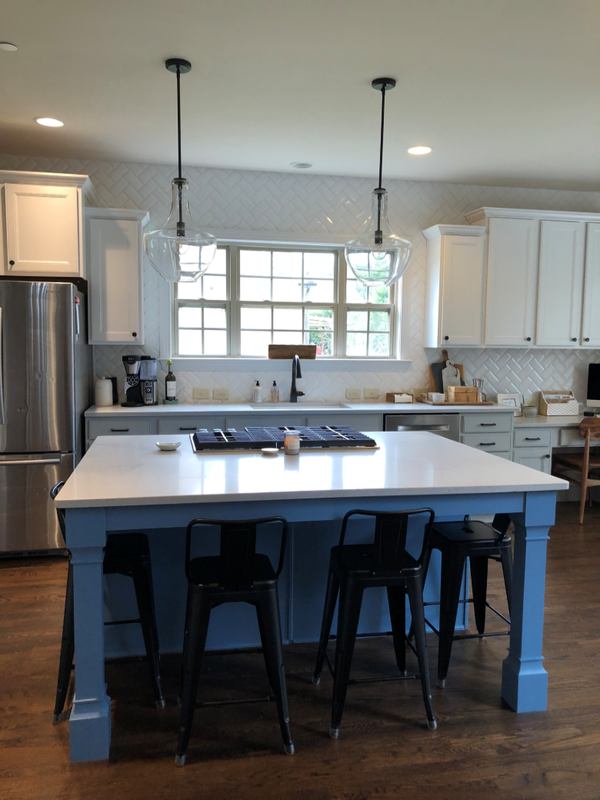 For paints, we went with Sherwin Williams Snowbound on the upper cabinets, Worldly Gray on the lowers, and a super fun, much needed color punch of Leisure Blue on the island. 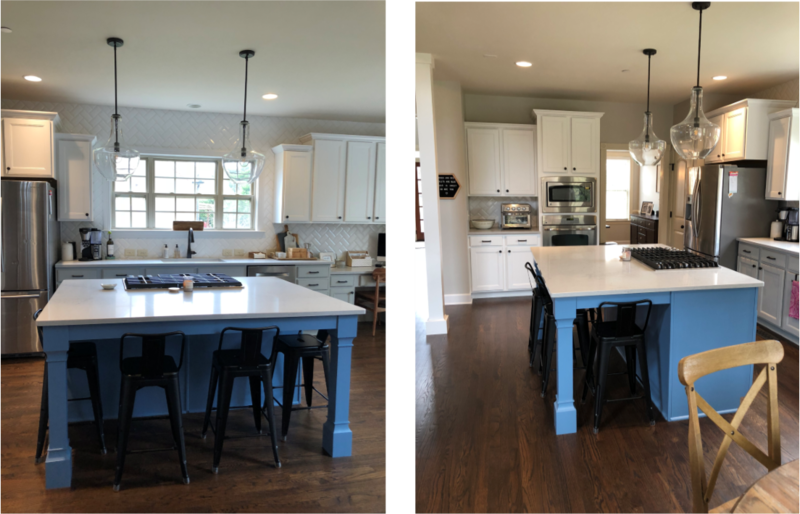 Nobel Gray quartz from Caesarstone was an easy choice for the countertops, which kept them light, but also gave us a rich marble look with the durability needed to withstand a busy family lifestyle. Lastly, modern accents of super dark bronze in our hardware and lighting, round out our transformation. With just these simple changes it allowed us to not only get the kitchen to function properly with updated finishes, but it allowed us to do some other much needed modifications such as refinishing all of the hardwood flooring, as well as making simple updates to the stair railing and switching out the entire house with new lighting! An updated open floor plan, light and bright, with counter bar seating for the entire family!! Taking the backsplash up the entire wall gave this quick renovation another layer of texture and made those ceilings soar! Wishing our clients many happy years to come in their new home! Welcome to Nashville! !